Tinytags are monitoring temperature and RH to help protect collections on display and in storage in a railway museum. Monitoring helps ensure the ongoing preservation and conservation of museum artefacts to ensure they are kept in the correct environmental conditions. Rushden Transport Museum in Northamptonshire is home to a collection of artefacts relevant to the history of road and rail transport with particular reference to Rushden and the surrounding area. 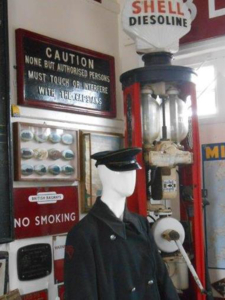 Displays are housed in four rooms of the restored Victorian (1893) Rushden Railway Station, with collections also stored in a nearby a port-a-cabin. The Museum is aware that neither the brick-built station building, nor the port-a-cabin is ideal. Restoration and maintenance of the station building has proved effective, however it remains uninsulated and draughty, relying on electric heaters to provide some warmth in winter, the normal closed season. A dehumidifier is also used in the winter. The cabin is of wood construction and has no heating. To ensure the collections are maintained in the correct conditions, the Museum uses two Tinytag Ultra 2 Temp/RH loggers which are rotated throughout the display areas and store to provide an indication of conditions across the whole site. The collections comprise approximately 1,000 items in a broad range of materials and include items such as photographs and paper ephemera, textiles, metal, wood, ceramics and leather, often in composite artefacts. The environmental monitoring programme set up in 2011 revealed that these collections are kept in conditions where low temperature and high levels of humidity are regularly experienced, however evidence of mould growth or rust is not apparent. Conservation advice suggests that this may be due to good ventilation and the combination of low temperature with high humidity, which impedes the chemical changes that might otherwise be anticipated. Evidence of negative impacts is not obvious and the conservation advice suggests that the present environment is maintaining the collections in a stable condition. Without further investigation the Museum is reluctant to change the environment significantly in case the balance is upset and creates more harm than good. However, it is in the forward development plan to improve the electrics, heating and insulation in the building and in the meantime they continue to monitor the data to ensure the artefacts are not adversely affected. Jane Demet is one of seven volunteers on the Museum Management Group, and works alongside Museum Manager Gwenfra Walpole with a specific interest in monitoring the collection. Jane comments, "In my experience the Tinytags are simple to set up, straight forward and flexible to use. The software is suitable for volunteers to use and display enough detailed information for our monitoring program and enable us to work in accordance with the national Accreditation Standard. I also like their small size and inconspicuous shape." Jane continues, "I am impressed by the significant amounts of data that can be stored by the loggers and am completely satisfied with the efficiency of the calibration service offered by Gemini Data Loggers." Rushden Transport Museum is a registered charity. As well as the station buildings housing the collections, adjacent buildings and running track are the setting for the Society's historic vehicles and trains. Regular themed weekend events and heritage train rides are held throughout the year.